New Candidates are Joining the Race! Plus new issues to find a stance on, a new random event, and more in v1.1! Play as one of over a dozen new candidates! Choose from previous politicians who were petitioning for presidency! 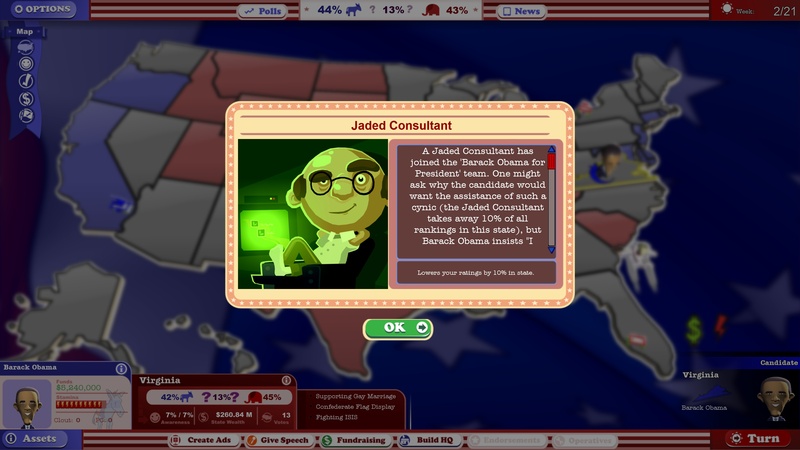 You've been asking when you could play as old candidates, and the answer is: right now! The added campaigners include Barack Obama, Sarah Palin, John Kerry, Ron Paul, and more. There is never any guarantee that things will go smoothly during an election season -- heck, it's probably guaranteed that things will go wrong during an election season! The newest event in this update will test how you deal with the death of a supreme court justice. Will you buckle under the pressure when the votes are on the line? Take a stance on brand new issues! To enrich your experience, several new facial customization options have been added for female candidates. The team has also added UI scaling for folks with high resolution monitors. Multiplayer mode now also has a "time left" function that will show in each game to note how much time you have until the game auto-advances to the next turn. 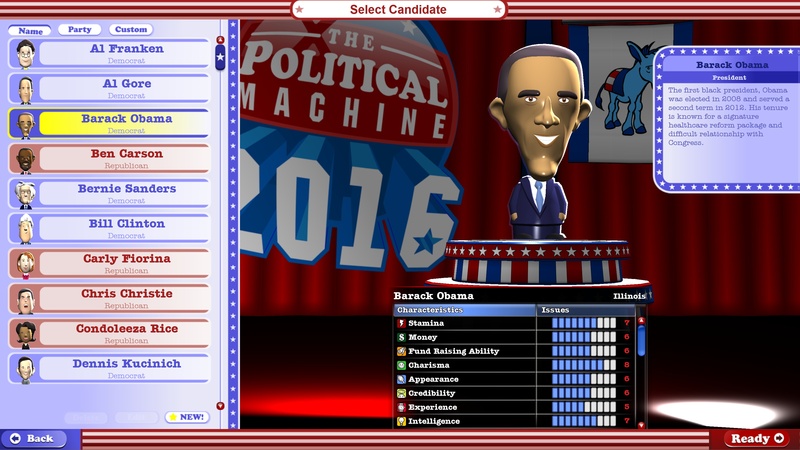 Play The Political Machine 2016 Now! Added over a dozen new candidates from previous election seasons including Barack Obama, Sarah Palin, John Kerry, Ron Paul and many more! A new random event and several new issues ripped from the headlines. Issues and candidate stances have been updated based on current events. Added UI Scaling options for those with high resolution monitors. Updated issues and candidate stances based on current events. Added new issues including Bathroom Bills, Fixing Flint Water Crisis, and more. 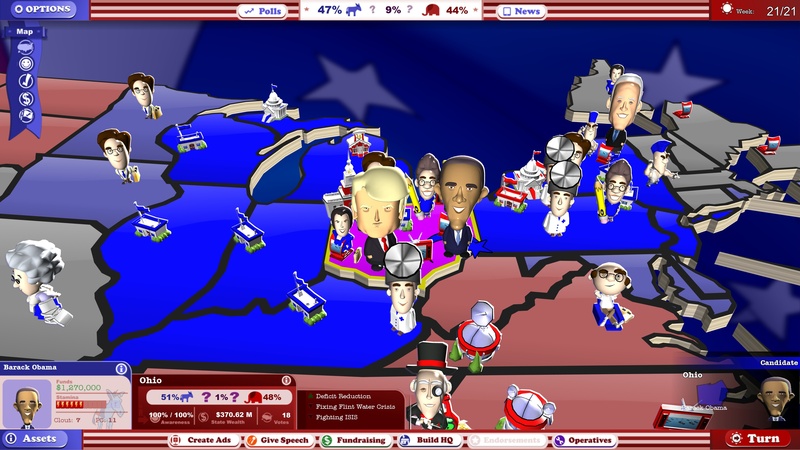 Added the new Candidates including Barack Obama, Sarah Palin, John Kerry, Ron Paul and many more. Added several more facial customization options for female candidates. Added biographical information to the candidate selection screen. Added UI Scaling options for folks with high resolution monitors. Removed the "sort by custom" button for sorting candidates from the running mate screen as custom candidate's cannot be selected as running mates. Fixed missing thumbnail images for running mates. Removed the step of manually close the "save" dialog after saving a custom candidate. Fixed overlapping clickable bound boxes of the buttons on the Title screen. Added a "time left" display for multiplayer games. Before it wasn't clear home much time remained before the game auto-advanced to the next turn. Fixed bug where pressing the Main Menu button after an MP match would take you to the Multiplayer Lobby instead of the Main Menu. Fixed a few cases where players couldn't join a second game after starting another one. Creating a new custom candidate while in the Match screen will no longer kick you back to the Main Menu. Peers that enter a lobby after choosing a character will not have a blank character image and text fields. Addressed some issues with incorrect leaderboard match reports. Fixed a few issues that would cause the game to hang if Steam crashed or quit while the game was running. 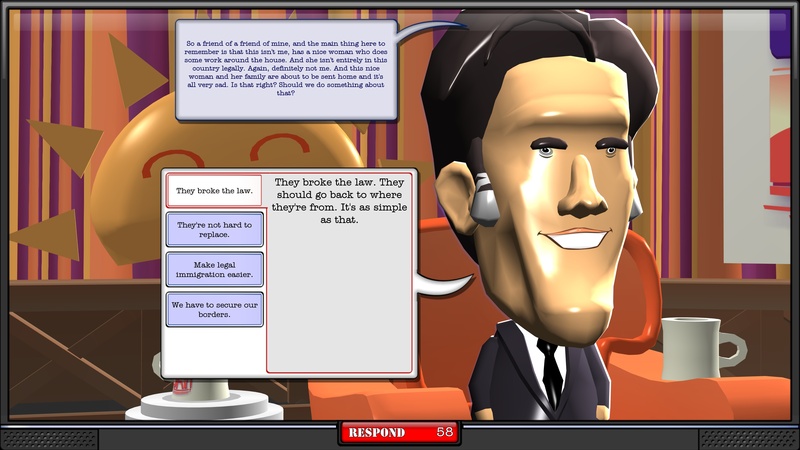 Fixed issue causing game to show some interviews a lot more than others. Fixed bug where you'd get access to more issues building in a state. Now, you only get access to more issues if you have a HQ building in the state.